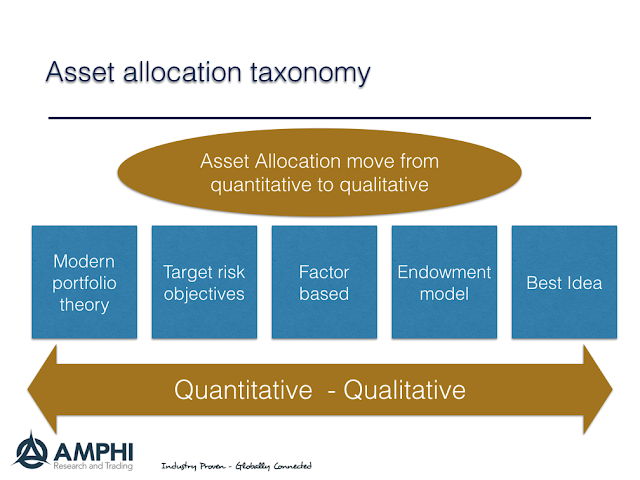 There are a wide set of allocation approaches but there has been little work at trying to classify them. Nevertheless, a classification scheme will help the investor understand how are bets taken and bundled within a portfolio. It will provide an idea of the information requirements and a view on how the financial world works. Asset allocation can fall in a spectrum along a quantitative or qualitative range. At one extreme is the use of modern portfolio theory or one of its derivatives. Given the amount of research done on the MPT approach, we can be precise with describing its limitations. 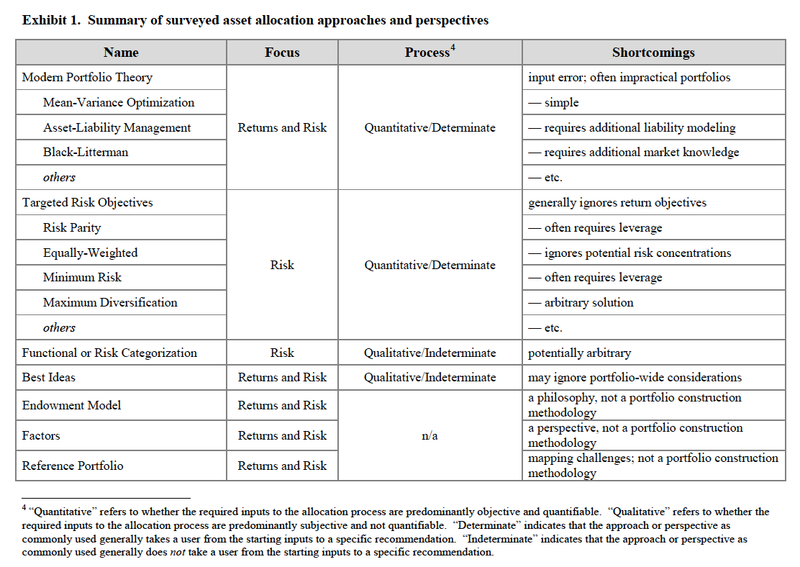 Some of the inputs could be qualitative but the asset allocation mechanisms is based on optimization across return, risk, and correlation. At the other extreme could be an approach called best ideas which tries to bundle a set of best trades within a portfolio. The endowment model often described as an effective strategy is actually very qualitative and somewhat arbitrary. 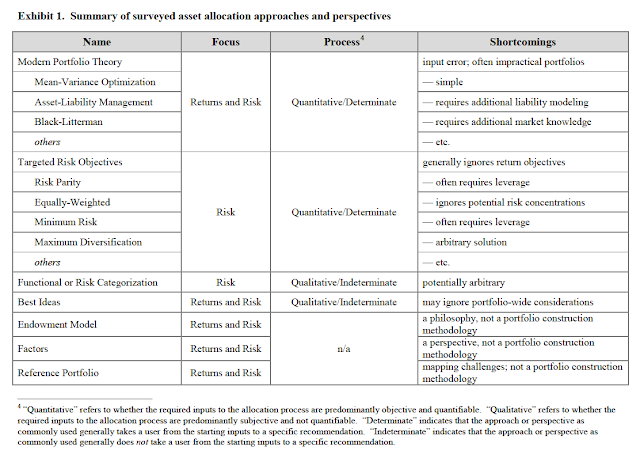 On the other hand, risk targets given measurement requirements, will fall more into the quantitative approach. The detailed exhibit below is from a QWAFAFEW presentation by Mark Szigety and gives more details on the classification system. The type of asset allocation approach can be classified according to its focus, the process, and shortcomings. No one approach may be better than another but each is based on a view of the world, efficiency, and the use of inputs. By actually admitting to a specific asset allocation approach, investors can better understand their risks and limitations for generating returns. It seems that most investors will fall into a hybrid approach that combines quantitative work with a philosophy and market perspectives. Most investors do not want to be bound to a set of strict rules but will, nonetheless, have a portfolio construction methodology. If you cannot provide an allocation philosophy or methodology, you will have portfolio construction problems. What is the Fed's reaction function? What type of central bank is the Fed? A failure to communicate by the Fed? FIA Expo - What is the value to the customer? Baltic Dry Freight Rates - where is the trade?